I hope you’ve been getting along OK sewing all those triangle squares! I’m back today to post the setting instructions, so when you’re ready, they’ll be available. And if any of you are already ready, you won’t get held up any longer waiting. When you’re done making all your blocks, you should have 14 leftover block sections. We are going to use these for the setting, but first we need to cut some additional background pieces. 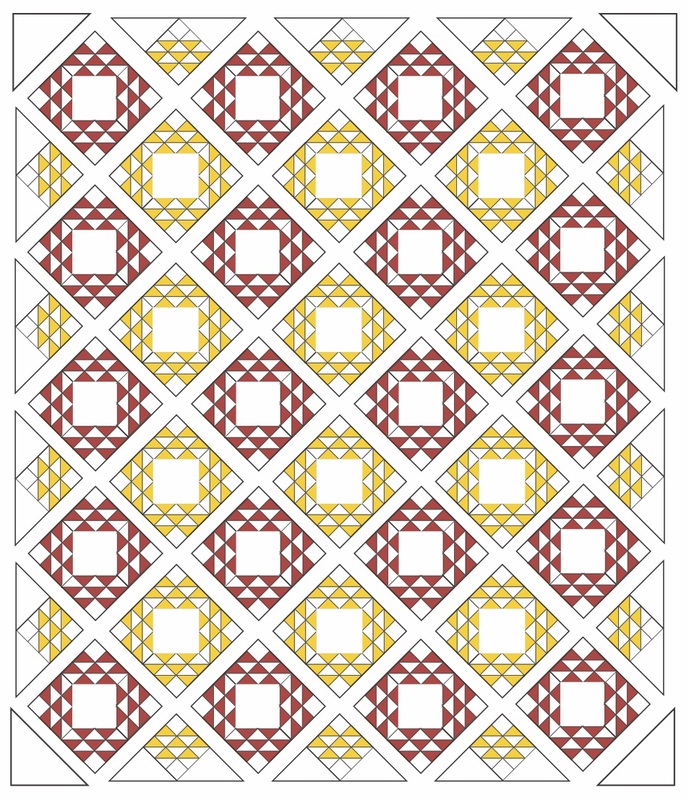 From your background fabric, cut nine squares 10″ x 10″. 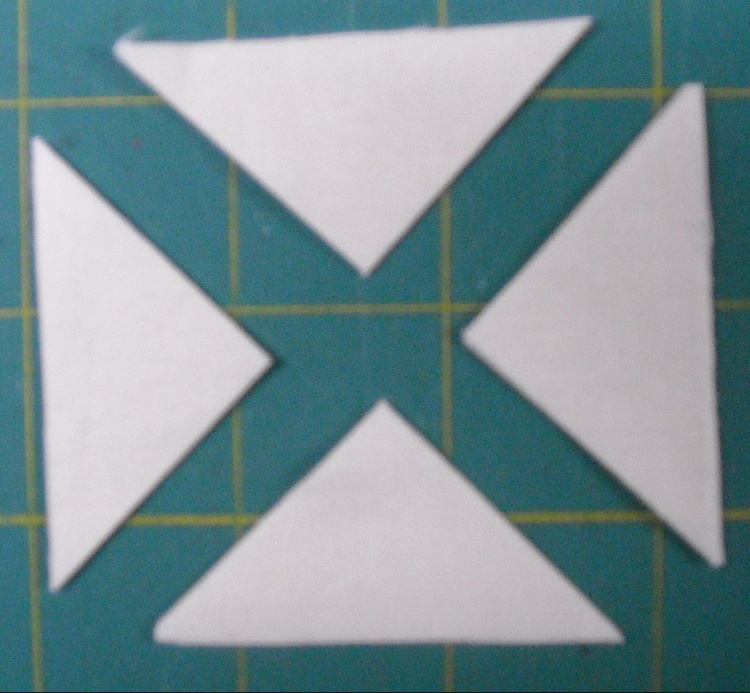 Cut two of these squares in half on the diagonal to make a total of 4 triangles. Set these aside for now. 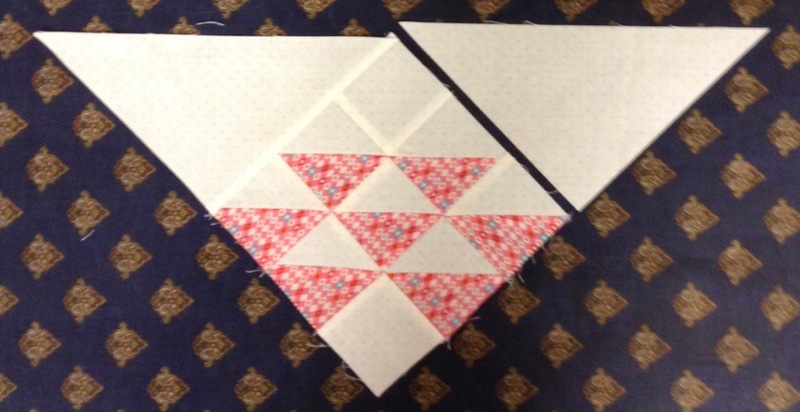 Cut the remaining seven squares in half on the diagonal twice to make 28 triangles. We’ll use these first. Also cut nine strips 3 1/2″ wide x the width of fabric. Set these aside for the borders we’ll be doing next week. 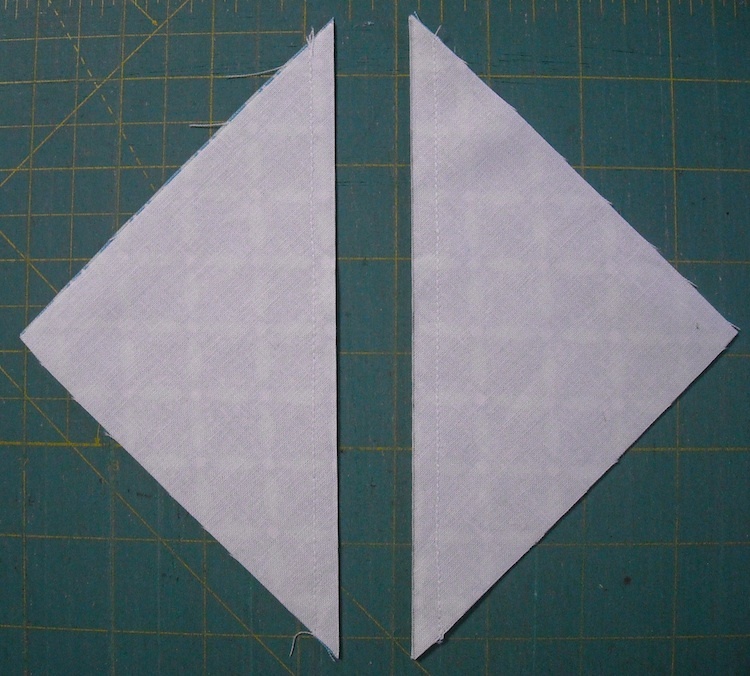 Sew the short side of one setting triangle to one side of the block section, and press the seam toward the triangle. 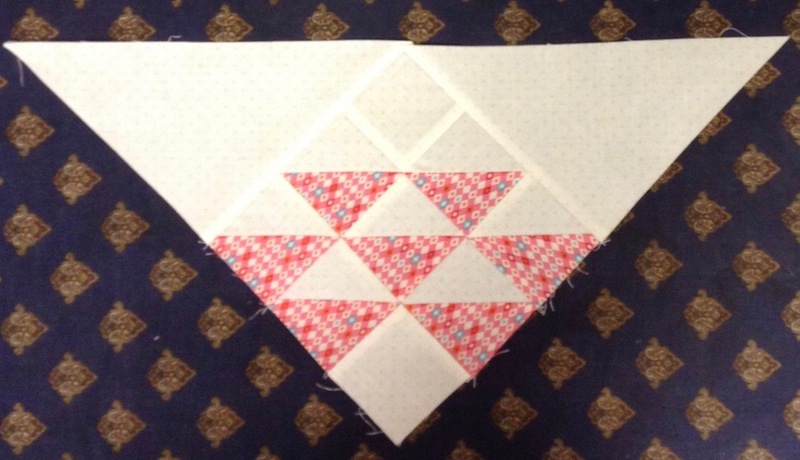 Make sure you are not stretching the triangle piece as you sew it on, as there is a bias edge on it. 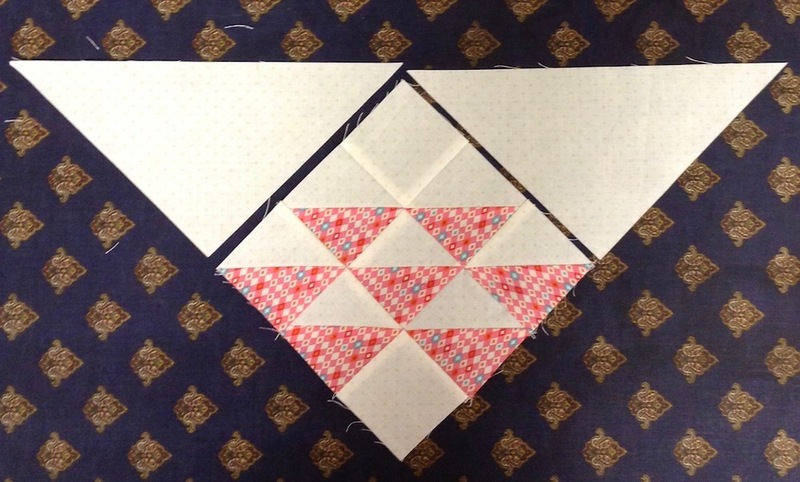 Sew the other triangle to the adjacent side of the block section, again pressing the seam toward the triangle. Make 14 setting sections like this. Don’t worry about the triangles not fitting just right. We’ll be trimming it all even before we add the borders. They should be a bit oversized, so they’re easy to sew and you don’t have to be too careful (even tho mine don’t look too oversized in this photo). Now you can start arranging all your blocks into a layout that you like. Since I made all my sections from one color, I had to put them on my design wall in order to get all the colors evenly distributed across my quilt top. 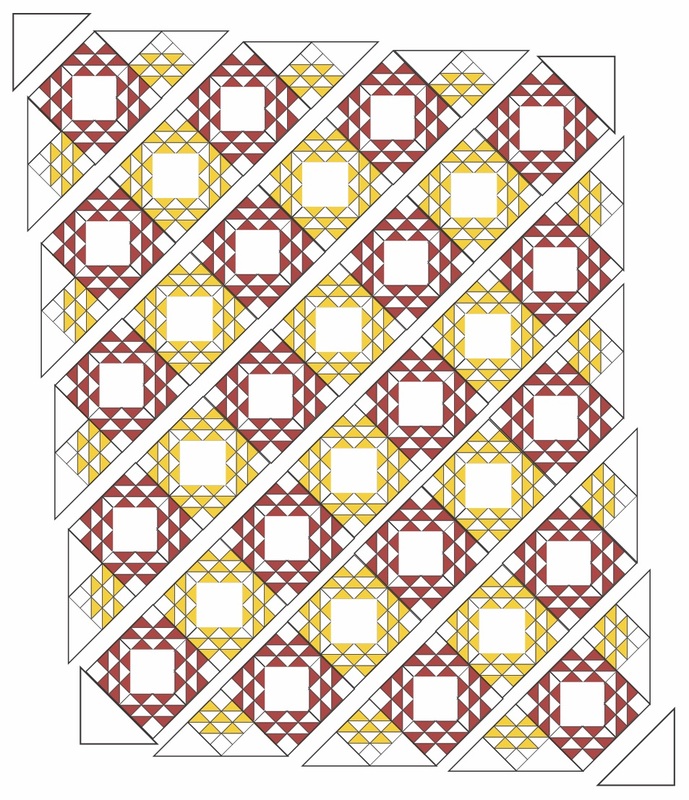 If you’ve done completely scrappy (or two-color), this part will be much easier for you! The next step is to sew them together into diagonal rows. You can press your seams however you choose. Then join all the rows together to complete the center portion of your quilt top. I’ll be back on March 6th with information on adding your borders, so happy stitching this week! Ok Shelly, I’m getting confused. Maybe I’m putting too much thought into the borders. I have fabric that I can cut the 4 full lengths of the top, bottom, and sides, rather than piecing the 9 – 44″ lengths. So I tried to calculate what you were doing and you’re cutting a total of 396″ with those 9 strips. But even if I were to miter the corners and have 2x the 74″ and 2x the 91″ I only come up with 330″. Since I want to cut the 4 long strips, what am I missing in the planning, or can I not do that?